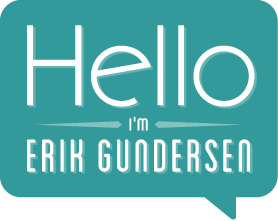 My name is Erik Gundersen, I'm a visual artist, photographer, and all-around creative person. Both my professional and personal time are spent creating in many forms. My education and experience have given me a firm grasp on many aspects of design, ranging over a variety of mediums and skills. My visual design knowledge include skills in graphic design, web design, graphics production, photography, and image editing. My ability to adapt and a strong attention to detail are two attributes I pride myself on. I enjoy trying new things, being challenged, and learning in the process. (2014 - 2016) Independant Search Engine Evaluator @ Leapforce: Reviewing a variety of desktop and mobile search engine content directly related to user searches and their subsequent results. Comparing and rating search engine content in a variety of forms. Providing feedback about supplied content, such as overall quality, helpfulness, and relation to a user's intent. (2008 - 2016) Freelance Designer: Creating a variety of digital & print media projects from concept to completion. Communicating with clients and developing design solutions. Production design and setup of visuals/graphics for internet and print uses. Project planning, creation, implementation of various media solutions. (2007 - 2008) Designer @ B&Y Distributors: Created layouts and graphics components for internet/website use. Developed visual presence and design of high traffic eBay & e-commerce stores. Daily maintainance of graphics, eBay auctions, and product photography. (2002 - 2006) B.A. Degree in Liberal Studies - University of Central Florida: Core concentrations in Art Studio, Digital Media, and Criminal Justice. Strengthened artistic abilities, sense of composition, and visual techniques. Merging artistic talents with courses in web design, programming, and production.